Last year, foreign envoys deployed in New Delhi took up the life-threatening air pollution issue with India's Ministry of Foreign Affairs. The city’s air pollution is mainly attributed to biomass burning, including stubble burning, which causes 16% to 30% of the pollution. Indian farmers often burn the grain harvest's leftovers to clear the farms. 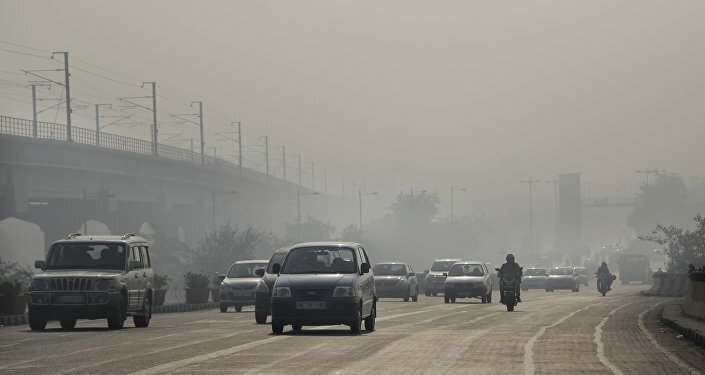 New Delhi (Sputnik): The Indian government has started the installation of cost-effective homegrown air filters on the roadside of the national capital Delhi, which has been witnessing the accumulation of killer smog during winters over the last few years. The installation of the devices started at two heavy traffic junctions — ITO and Mubarka Chowk. In the next 20 days, the device, named WAYU (Wind Augmentation Purifying Unit), will be installed in at least 54 places in India's national capital. WAYU is developed by the state-funded Council of Scientific and Industrial Research and has the capacity to purify the air in an area of 500 meters square. The device consumes only half a unit of electricity in 10 hours and has a maintenance cost of only INR 1,500 per month (around US$20). "We are in the process of developing a bigger version of WAYU which can purify the air in an area of 10,000-meter square and also the designs of future WAYU devices will have even better aesthetics and can be deployed in bus shelters," Harsh Vardhan, India's Science and Technology minister, said. The indigenous device works on two principles, mainly wind generation for dilution of air pollutants and active pollutants removal. The device has filters for particulate matter removal and activated carbon (charcoal) and UV lamps for poisonous gas removal, such as volatile organic compounds and carbon monoxide. The device has one fan and a filter for sucking and removing particulate matter. Last year, India's apex court appointed an Environment Pollution (Prevention and Control) Authority to draw out a graded response action plan for taking emergency measures in the national capital to combat and counter pollution spikes — a concept borrowed from Beijing.